What's It Like Being an Extra in a Film or TV Show and How Do You Get the Gig? William K. asks: What’s it like being an extra in a movie? Becoming a Background Actor, or “extra” as they are more widely known, is a fairly simple process that usually involves little more than responding to an ad. Depending on the scope of the project and the kind of extras needed, this ad could appear anywhere from a dedicated website to Craigslist- we even found examples of casting directors using Facebook and Twitter to round up extras quickly in a pinch. For the professional extra (and yes, these are a thing), they may even have an agent who helps them book gigs to sit, stand, or walk in the background of some scene in a movie for barely more than minimum wage in some cases. Of course, if they are a career extra, they tend to be members of SAG-AFTRA and earn a much more respectable amount, on the order of around $175 per work day, plus more if a given shoot lasts more than 8 hours, which isn’t uncommon. 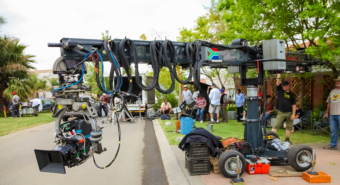 There are also a slew of other ways money can be tacked on in a given day’s work, like letting the filmmakers use your car in a scene or maybe bringing your own needed props, like a baby stroller. Similarly, if you are required to smoke during a scene, required to get a certain haircut or wear a substantial amount of body makeup, if there is a delay on a meal break, etc., you get additional pay bumps. That said, as in all things on the set, even when the extras’ buffet table looks like something from the most opulent of aristocratic parties, the talent get the best food of all, and an extra trying to eat from that table is likely to get a swift, and occasionally harsh, rebuke. As for how easy or hard it is to get a gig as an extra, if you’re patient and have a flexible schedule, this doesn’t seem terribly difficult from all accounts we’ve read. What is difficult is getting enough work to make a career out of it, though there are a select few who’ve managed this. For most, however, it tends to be more of a hobby. For others, they try to use it as a way to break into the industry. However, it’s noted that this almost universally won’t get you far, other than the value in getting to observe the film making process up close and personal. Of course, if you’re an established extra with a good reputation and you happen to resemble a given lead actor in various body features and the like, you may ultimately leverage that to being used as a stand in- the people who are used in place of an actor for the purposes of setting up the scene. The great thing about these gigs is that they pay a lot better and, for example when talking a TV show, if you do a good job might mean a regular gig you can do for potentially several years for a nice steady paycheck. Going back to people who have a little more, shall we say, “unique” look, a silver lining of standing out is that you could potentially still be a bit actor, as films and TV shows are occasionally in need of people with a specific “look”. Of course, the problem here is that such casting calls are seldom kind or tactful- they know what they want, and they are looking for someone who doesn’t mind unabashedly flaunting what they’ve got in that way. So, for example, if you’re extremely overweight or grotesquely ugly by conventional standards, the best advice of others in this position is to grow very thick skin if you also want to make it in the industry. On the other end of the spectrum, contrary to what you’d expect, being extremely attractive won’t usually bolster your chances of scoring a gig as an extra. Again, they don’t want someone who will distract the audience watching at home. As with all things, there are exceptions to this, of course. For example, a scene in, say, a strip-club, will likely feature a handful of very scantily clad extras of the extremely attractive variety. Again, the running theme here being horses for courses. Speaking of animals, this all brings us around to what it’s actually like being an extra on a set. In a word- boring. In three words- mind numbingly boring. In six- mind numbingly boring and occasionally degrading. You see, among the lowest on the hierarchy of a set is almost always the extras. While, as ever, there are plenty of exceptions, with the likes of George Clooney having a reputation of doing his best to combat the poor treatment of extras on set and otherwise embodying the “good guy” persona, in the general case you can expect to be treated as disposable cattle most of the time. In regards to the filming process itself, extras, like children in a stereotypical British household, are expected to be seen and not heard. Beyond it being strictly forbidden to talk to the talent or distract them in any way, even in off time, in order to keep the various sounds in the film as isolated from other noises as possible, the mics are usually targeted at only recording the voices of the talent. Virtually all background noises are then added in post-production. In addition to background chatter, this includes noises you aren’t even expected to notice, like the ruffling of the main character’s clothes as they walk or the clink of a cup being placed on a table. This is generally one of the more difficult things for extras to get good at as many people find it unnatural to make silent vocalisations without overcompensating by moving their eyebrows too much or otherwise trying to use body language to make up for the fact that they aren’t making any noise when fake talking. To avoid this, beyond being conscientious of body movements, some extras practice nonsense phrases they can repeatedly mouth to one another. For a little fun, pay attention to talking extras in the background next time you watch a movie. You can almost always spot the newbies from the veteran pro extras because of things like this. On that note, because most sounds are added in post-production, scenes involving parties, dancing, or cheering crowds are an especially surreal experience for extras, as the set is almost always completely silent while filming, other than the talent doing their thing. This poses another unique challenge for extras who are required to dance to a song they can’t hear, in time with other people listening to the same, non-existent song, all while pretending to ignore whatever the main actors are doing. And with cheering crowds, extras must be extremely careful not to actually make any clapping noises while they clap and otherwise raucously cheer silently. For those attached to their phones, it should be noted that smartphones and other such devices are largely banned from TV and movie sets, at least when talking about extras. Extras also are generally required to sign non-disclosure agreements right off the bat, barring them from talking about what they saw on the set at all, particularly on social media. Ironically enough, that means this was almost literally the first rule on the set of Fight Club. It’s also important to note here that a given shoot might easily last 10-15+ hours, during which the extras are mostly to be found waiting around for someone to tell them what to do. This could mean sitting or standing quietly, sometimes for hours at a time, and, at best, whispering with other extras, or in many cases required to keep completely silent. When not required to be in a given place, extras generally congregate in some designated area away from the important people, where they read, chat, play cards, or otherwise find any way possible to stave off boredom. Beyond being boring, in some cases the life of an extra can also be extremely uncomfortable. For example, if a scene is supposed to be in the winter, but it’s actually the summer and 100 degrees outside in balmy southern California, they’ll nonetheless require you to wear appropriate winter clothing and jackets for outdoor scenes, and vice versa in the winter when a scene is supposed to be in the summer. Going back to the general case, extras are usually expected to wear mostly unremarkable clothing featuring muted colors that won’t stand out on camera. Also important here is that the clothing must be devoid of visible logos or branding. This is mostly due to the fact that showing brands or logos on screen usually requires someone, somewhere to sign off on them appearing on screen, but can sometimes be because the production has a deal with a specific brand or manufacturer. To maintain continuity between shots, extras could, and in most cases will, be expected to wear the exact same outfit multiple days in a row if a scene takes multiple days to shoot, with some directors going as far as to have pictures taken of individual extras to ensure their outfit and hair remains the exact same between takes. In the end, if you don’t mind crappy pay, uncertain and irregular work schedule, long hours of mind numbing boredom, repetitively doing the same thing over and over and over again, and generally being treated like something the directors found stuck on the bottom of their shoes, you too can enjoy the benefits of amazing catering and potentially being barely visible in the background of a given scene of a movie for a few seconds. It’s inevitably the stunt guys who have the fun of actually getting into a fight. The moment they die, however, it becomes the humble extra’s job to lie on the ground and play their corpse for the rest of the shots in the scene. So that’s what I did for two weeks of my life. I [laid] on the ground, outside, in the middle of February playing a corpse in a major motion picture. It was simultaneously the least and the most glamorous thing I’ve ever done in my life. Still, we guess there are worse ways to spend an afternoon than eating phenomenal, free food while occasionally catching a distant glimpse of Ryan Reynolds who is, of course, dreamy. Because of the high price of paying a crowd of thousands of extras, for most films and TV shows where such is required, these are almost always digitized audiences or a group of extras shot such that they can be overlayed to fill out a stadium. Cardboard cutouts are also commonly used interspersed with real people, though tend to stand out if the camera is moved during the shot. For these cases, another option available for the director wanting something particularly realistic looking are inflatable extras which, yes, are a thing and if you watch closely can be occasionally spotted interspersed with real people in crowd scenes. Hey Karl, on your article about the Normandy Hedgehogs, there’s a typo where you said piece instead of pierce. Other than that, great read. Love Fact Fiend by the way.